With FALL weather just around the corner, I started thinking about pumpkin recipes! Have you ever had pumpkin for breakfast? Well you can now! 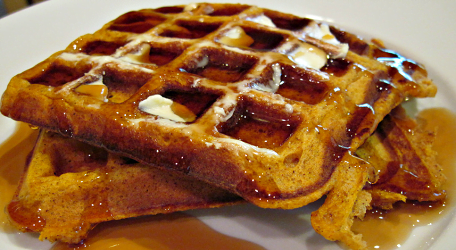 Fix these 5 ingredient Simple Pumpkin Waffles on a fall morning and I guarantee your family will love it! You will need these 5 ingredients. Heat waffle maker. While it’s heating, mix together the canned pumpkin, softened cream cheese, powdered sugar and pumpkin pie spice in a medium bowl until smooth. Divide the dough into 8 rolls and slightly shape each roll into the shape of a small bowl, with the cinnamon-sugar side faced down. Spoon about 1 tablespoon of filling into each bowl. Top with the remaining four rolls with cinnamon-sugar side facing up. Pinch sides shut.